Okay, Twitter is pretty basic, right? It’s social media boiled down to one hundred and forty characters, which the whole world can see. Wait… but only if they follow you, right? Well, not exactly. Once you start using Twitter, you realize that there are many easily overlooked details. If your goal is to share content, drive traffic, increase brand awareness, or any other sharing based goal you can’t afford to ignore Twitter. This social media behemoth involves many terms and nuances, but by the end of this article you’ll be a master of the Twitter-verse! Here is a list of terms and ideas this article covers. Select one to jump to that section or just keep on reading. When you create an account, others can follow you (your profile). Conversely, you can follow them (their profile). Okay, this is the most fundamental distinction in Twitter. It’s important to understand how tweets relate to profiles. A profile can post tweets and other profiles can see those tweets. In other words, when you follow someone you are subscribing to their Tweets. There are other ways people can see your tweets but more on that later. There are almost a billion Twitter profiles, and at times it will seem that your Twitter existence is a drop in the ocean. It’s a big world where everyone competes for attention. But getting attention on social media is a whole other can of worms. Before you get people’s attention, you need figure out who to engage with. That’s why you want to search for terms/people/organizations related to your interests and use the results to follow profiles. Watching how the pros use Twitter will give you ideas about how to get ahead. It will take some time to get a lot of attention. Additionally, when you find a profile that meshes with your interests or business goals, you can start following the people that follow that profile. You have up to 2,000 profiles to follow and following someone is a good way to get followed back. NOTE: You will notice that some profiles follow a lot more than 2,000 accounts. This is covered later in the article, but to put it simply — You need more than 2000 followers to follow more than 2000 profiles AKA positive follower ratio. Creating and posting great content is even better than being a follower but let’s not get ahead of ourselves. I promised that you’ll be mastering Twitter terminology, but that is quite different from being a Twitter master. Some people are very protective of what they let the Twitter community see. For these folks, there are options to prevent others from seeing tweets until they get approved. This setting is called Protected Tweets. They don’t show up in Google search and only approved followers will see your tweets and mentions. In extreme cases, you can block profiles from accessing your tweets. You can also mute someone if you don’t want their tweets in your feed. Muting allows you to continue benefiting from followers activity (ex: retweeting your tweets) but prevents them from flooding/obscuring your feed. The alternative to muting is blocking or unfollowing them. The difference is that muted accounts don’t find out that you chose to mute them. They will still be able to send you direct messages and their notifications (favorites, retweets, replies) will still show up. Additionally, you can unmute them at any time. Speaking of muddying up a feed, some profiles retweet WAY TOO MUCH!! In these situations, first go to their profile and then select the profiles settings (gear icon) and click “Turn off Retweets”. Conversely, if you can’t go 1 second without knowing the activities of a certain profile you can select “turn on mobile notifications”. This only works if you have mobile notifications enabled in your profile settings, along with having the Twitter app on your smartphone. In general, if you follow everyone left and right, your twitter feed will become cluttered and clogged with irrelevancy. Only follow important/relevant people, companies, ideas, events and so on. This way, you’ll enjoy a rich twitter feed. It will also help digital PR (Public Relations). Why PR? Well, if you have 30 followers and you follow thousands of people, you aren’t going to look very credible. If the topics you follow and share are all over the place, people won’t know what to think or expect. Engage in a relevant way so people know where your interests lie. Pay attention to your follower to following ratio, as this is an authority signal to would-be followers. Additionally, Twitter won’t let you follow more than 2,000 profiles until your “follow to following” ratio becomes better (Twitter doesn’t reveal this ratio). Followers may look at your profile name, your bio, but most likely they’re looking at what you share. After all it’s your tweets that will show up in their feed. Earlier, I mentioned that people can follow you (your profile). Why did I make the distinction between you and your profile? Well, because a profile can represent multiple different things. You will see different types of profiles. People make profiles for their business, and this is quite different than the employee representative account. Additionally, the personal account is wholly different from the previous two. Usually, these distinctions will be obvious. Look for a first name and company affiliation, and the account type should help you understand how to interact with them. All profiles start with the @ symbol and act as links to the profile. For example, when you Google “@JimCarrey” a link to his twitter profile will be the first thing you see in your results. Once, you and another profile follow each other (reciprocal follow) you can send each other direct messages. In fact, this medium is very useful for customer service and many businesses have set up a dedicated customer support Twitter account. 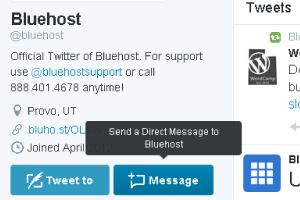 For example, if I have a problem logging into my Bluehost account I can tweet or direct message @Bluehostsupport. This brings us to the concept of direct messaging (DMs). These are direct chat messages that only the participants can see. This is done one-on-one as well as with a group. These messages can include photos, links, tweets, or emojis. Direct messages started out with a limit of 140 characters (just like the tweets) but Twitter plans to change that. This is actually taking a bit longer than initially thought, likely to give Twitter API users time to adjust their code. Edit: It seems that as of August 12th the 140 character limit was removed. You can send Direct Messages (DMs) to anyone who follows you. Some profiles have a setting enabled which allows anyone to send them a DM. This is useful when the purpose of the account is to provide customer support, as in the case of @Bluehostsupport, our server host. If you thought that this is too straightforward, here is a curve ball. The idea that a DM can include Tweets can be a little confusing. There is a symbol that looks like three dots next to each tweet. This is referred to as the “more” or “overflow” icon. When you select this, you will have the option to send a direct message with the contents of that tweet. Additionally, you can copy the URL for that tweet. You may find it interesting that each tweet has its own URL. Other options include: getting the code to embed, mute, block or report the tweet. Note: You will not be able to receive messages from profiles that you have blocked. This is an intuitive feature but still important to remember. The symbol that is suggestive of the recycle icon under each tweet signifies the “Retweet” concept. What actually happens when you click this button? Answer – you share this message with your followers. Note: It could be a retweet of a retweet, but not a retweet of a retweet of your tweet, tongue twister, right? When you look at various tweets, you can see the engagement rates by looking next to this icon to see how many times this tweet was retweeted. This can give you an idea of the popularity of the concept being shared and it helps to assess the original profile’s social authority. Although it is similar to a tweet, it will be labeled differently for you and your followers. For example, you can visit someone’s profile page and see that their feed consists of other tweets in addition to their own. You will also find that some profiles retweet all day long. Each of these tweets will display the retweet logo, and who they retweeted. Here is an example of a retweet. This feature is useful for quickly adding content to your profile. At first, it is difficult to position yourself as a thought leader. This will come with time and after you create enough authoritative content. Assuming you just created a new Twitter profile, for your blog/app/site/event, you will want to retweet useful content for your community. For example, this website focuses on digital marketing. However, there are sub-categories in this field such as SEO, Content Marketing, Analytics, Social Media, PPC, and many more. If you want to segment tweets into category based feeds then lists are your friend. Jump to Twitter Lists section. A classic retweet is very similar to a regular retweet but doesn’t make use of the retweet button. You must highlight the whole tweet and paste it into a new tweet. The whole idea of a classic retweet is to add your own comments/questions. If you don’t change it at all, it will seem as though you are stealing credit for someone else’s tweet. Twitter’s “favorite” option is very similar to Facebook’s “like” feature. When you look at a timeline/feed you can click the star icon to “favorite” a tweet. The result is a notification sent to the profile that published that tweet. This is a way for Twitter to use crowdsourced feedback on the quality of profiles and tweets. They use this activity to figure out who is getting traction and who is an authority. Take a look at one of these notifications (From @LearnNetGrow). By clicking that star icon in my tweet, Adrian and Kait triggered a notification. Since they did it on the same day, they show up in the same notification. When I hover my cursor over their profile pic. or their nickname I can glance at a quick view of their profile and choose to follow them or not. In this case, I did because they both have a well executed and maintained profile. Later on in the article, under the automation section, you’ll learn how to automatically create a list based on the tweets you favorite. To see all the tweets you faved without using automation, go to your profile and click on the favorites link. Now that you know what a Twitter profile is, we can nail down exactly how “Mentions” work. 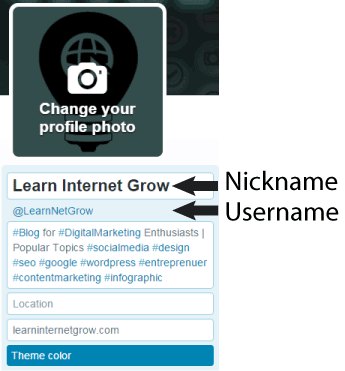 When you compose a tweet, you can include the name of a profile (Such as @LearnNetGrow). Recently, we published an article featuring advice from savvy marketers and when I shared it on our Twitter profile, I included their username so they get a notification. To feature each marketer separately, I shared the tweet multiple times mentioning each profile individually. Here is one of those tweets. Additionally, people who see this post may click on the username (mentioned profile) and become a follower. Often, when this is done well, they will appreciate the mention and favorite and/or retweet your tweet. This is the goal, mainly because social authority involves these metrics. Think about it, the more retweets, impressions, clicks, mentions, favorites you get, the higher your perceived authority. Closely related to a mention is the reply concept. Clicking the arrow icon opens a text box with a mention already prepopulated in the tweet. The prepopulated text will include all the profiles mentioned in that tweet. The reason this is similar to a retweet is because you can quickly turn a retweet into a reply. When you select the retweet icon, you can type a message into a text box. If you do this, the retweet becomes a reply. Technically, it’s called a “retweet with a comment” but the effect is one in the same. Closely related to a retweet and a reply is the Quote Tweet concept. 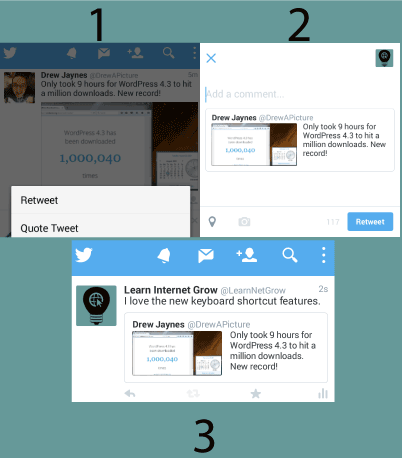 On the mobile app, when you click the retweet icon you get a choice of either retweeting or quoting the tweet. Someday when you look at your Twitter Analytics, you may find that one of your tweets has done much better than all the rest. What if there was a way to have that tweet at the top of your feed for everyone that looks? Well, there is and as you may have guessed, they are called pinned tweets. “How do I engage in this wizardry?” you say. First of all, this can only be done to your tweets, so no pinning retweets! First, click on the more/overflow icon (if you don’t remember what this is jump back to the Direct Message section). In case you don’t want to, it is the three dot symbol that looks like this. Click it and select pin to your profile. Now that tweet will stay put until further notice. F.Y.I. This new super power you have just acquired also applies to Facebook and Google+. Check out this in-depth Buffer article on pinning social media posts of Twitter, Facebook, and Google+. Just remember — you can only pin one tweet at a time so choose wisely. You can manually add a profile to a list. Doing this often can be a laborious process, since you have to navigate to the profile page, select the settings icon (gear symbol at the top right of their feed) and select “Add or remove from lists…” Then you either add them to a list you already created or make a new one. To look at a list’s feed, you simply need to go to your profile page and select”LISTS”. Once there you can see what lists you are “Subscribed to” and which ones you are a “Member of”, which means that someone else added you to a list. Clicking on a list will show you a feed of all the tweets from the profiles that are part of that list. Explore other lists by clicking on a profile hyperlink and clicking on their “LISTS” menu item. As you can see below, the @LearnNetGrow profile has 24 lists. Some of these lists were created by someone else and I subscribed to them. The remainder were created by me, both manually and through automation. For example, I regularly read articles on “SearchEngineLand” and so I subscribed to a list of all the contributors to that website. A list can be private or public, and a public list offers several benefits. The first one is obvious because your whole goal on Twitter is to get attention, and you can’t get attention with private content. A public list allows other profiles to “subscribe” to your list. You can see all of your “list members”, and secondly each listing has a convenient follow button. This is a way to save time on twitter. “Wait.. but you said making lists is laborious, nobody’s got time for that”. Enter marketing automation. Create a list by using rules. Remember when I mentioned your follower to following ratio? In order to keep this ratio close to 1:1 or better (positive ratio), you can leverage automated lists. This helps you get attention without following anyone. Attention, you say? Yes, every time you add someone to a list they get a notification. Here is an example of an item in my notification feed where @BloggerSidekick added me to a List they titled Inbound Marketers. When I hover my cursor over their nickname a preview of their profile appears. I can use this to quickly decide whether to follow them or not. In this case, I saw that they have a positive “follower to following ratio” and that if they ever retweet any of my articles or posts, it will increase the potential impressions considerably. SideNote: Their @name is slightly different from their nickname. Their handle (a different/worse way to say Twitter username) is part of the URL for their profile page and can’t contain spaces while your nickname can be different and can contain spaces. You may have noticed that the Twitter username for this website is @LearnNetGrow while the nickname is Learn Internet Grow. In Twitter’s documentation, they substitute nickname for “real name” which can be up to 20 characters long, and the username can contain up to 15 characters. I can change my nickname by going to edit my profile but changing the username requires going to your account settings. It is also advisable to let your followers know about your new username. Services such as Zapier and IFTTT (If This Then That) help you automate creating lists. This is incredibly powerful. Imagine that you can access a list of anyone who used a specific hashtag or mentioned a keyword. Additionally, since you can see a list of all the accounts in a list you can pick ones to follow much quicker than in a hashtag feed. Here is a link to an IFTTT recipe for automating a list based on a keyword or hashtag. IFTTT limits this list recipe to 5,000, but that shouldn’t be a problem. If you find that the hashtag you selected is too popular and your list fills up quickly there are a couple options. Once a list is at or close to 5K change the name so that a new list begins to aggregate. As an example, #digitalmarketing is a popular hashtag, so when it filled up I changed the name to append the current month and a new list was created by IFTTT. Try out advanced search to specify your query. You can use this to specify a date, place, person, or words to create a really specific list. Take a look at this Twitter support article on Advanced Search. Considering the number of other apps that integrate with IFTTT, the possible combinations of recipes is limitless. There are many things you can do and a complete list is impossible so instead go and create an IFTTT account and take a look at some existing Twitter Automation recipes. Zapier (free trial) is a bit more advanced and comes with a premium, but IFTTT is a great start. Speaking of lists, let’s cover Hashtags. They allow you to associate a tweet with a topic such as #SEO. The hashtag symbol (#) also transforms all hashtagged keywords into hyperlinks. A click on one will bring you to a timeline/feed of tweets with that keyword. 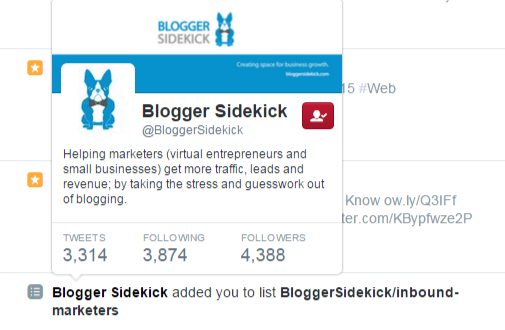 In the lists section, you learned how to create a list of profiles who tweet using a specific hashtag. This is a way to get noticed in a somewhat passive way. You don’t have to create an IFTTT recipe to see everyone using a hashtag. Visit the timeline for that hashtag by clicking on it. Additionally, you may google #socialmedia and the first result will show you the way. To learn more about hashtags check out our article about why all internet marketers use hashtags to grow their audience. You can take any tweet and embed it on your own site. Remember the more/overflow icon? In the drop down you’ll see “Embed Tweet”. Copy that code and put it into the HTML on your site. If you are using WordPress, you can switch to your “Text” view to accomplish this very quickly. Thanks to the asynchronous nature of the code, all of the stats will update as soon as something changes. “What could change?” you say, well someone could, retweet, reply, or favorite. Your home timeline on twitter AKA “Your Twitter Feed” consists of various components. A timeline is an aggregation of content. If you search for something in Twitter you will see a timeline for that search query. Your timeline consists of tweets and retweets from people you follow. That’s not all you’ll see there though. Let’s go over some recent changes. When you see content in your feed (timeline), you want to know why it’s there. Now as an addition, you’ll see favorited tweets from people you follow. Additionally, you might just see something that is “relevant” or “popular”. By relevant, twitter means that it is popular with your network. Twitter sees popularity as who interacts with a tweet and how much. In the past, feeds only included tweets and retweets from profiles you follow. 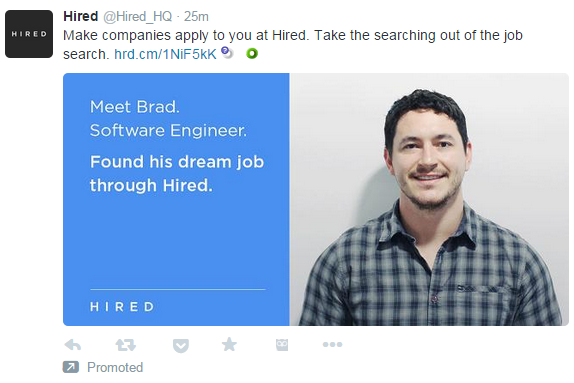 Then they added promoted tweets (paid ads). Now we see an expansion to relevancy and curated content (favorited tweets from profiles you follow). Here is an example of a promoted tweet. Interesting to note that when I attempted to embed it, the “promoted” message with the arrow at the bottom of the tweet was gone. Well, there it is, you have made it, you have mastered all the Twitter terminology you need to get started. There are many ways to provide value to your digital community. Start with listening and sharing relevant info. Start conversations and ask questions. Then move on to creating your own content and make sure to share it. Add images, videos, and hashtags and most of all follow the Golden Rule. You know, do unto others as you would have them do onto you. If you haven’t created an account yet, what are you waiting for, start building authority on Twitter. Once you create an account, please come back and please share by clicking the tweet button below.